Embrace (The Violet Eden Chapters, #1) by Jessica Shirvington. Publication Date : March 6th, 2012. I'll admit that my first impression of the book based on the initial 3-4 chapters was pretty bad. I found the writing abrupt and Violet just plain annoying. However, it got way better once I got past the beginning. On her 17th birthday, Violet Eden's whole life changes - she learns that she's half angel. Now Violet has to make a choice - embrace her powers or ignore them, which is proving to be really hard. Determined to find out more, Vi gets herself in all sorts of situations, mostly trouble. Embrace is another story about Fallen Angels but with a twist. The plot is fast paced and intriguing enough to keep you engaged through out. I found it hard to get used to Shirvington's writing style at first as I felt that the chapters didn't flow smoothly but like I said, once I got past the early awkwardness I was completely engrossed in her world. There's a love triangle that is a tad cliche but still pretty good. Violet's torn between Lincoln, strong, reliable and one of her closest friends (although she wished it was more) and Phoenix, the totally hot guy she should probably definitely stay away from but can't. Seriously, Phoenix and Vi redefine the term 'chemistry'. While I initially thought that Violet made an idiotic protagonist, she quickly redeemed herself as the story moved on. Sure, she's still stupid when it comes to guys but I won't hold that against her as long as she picks Phoenix (really, there's no competition). I'm honestly sick of reading about instant, forbidden love. I mean, Twilight's good and all but at some point I just wished Meyer would get it over with - finish the 'deed' and move on like Violet did. Also, I really liked that the characters' feelings developed over time in Embrace and wasn't just there for no reason. However, although Violet's emotions grew at a normal pace - okay, so did Linc's - I found Phoenix's side a little unsettling. His reasons for being attracted to Violet started out normal but somewhere down the line it all turned too intense, too much and too soon. Violet may be strong, powerful and pretty but for a guy who's been around the block more than a couple of times, she's shouldn't be that big a deal. Also, Violet's age made the intensity with both Lincoln and Phoenix a little creepy. Oh but I should probably mention that some of the things Lincoln said made my heart melt. Really. You'll know what I'm talking about when you read it. As for the plot, my favorite part was that Grigoris had a choice. 'The freedom of will' as Shirvington puts it. The characters had control over their lives, choices and decisions and that usually doesn't exist in books. 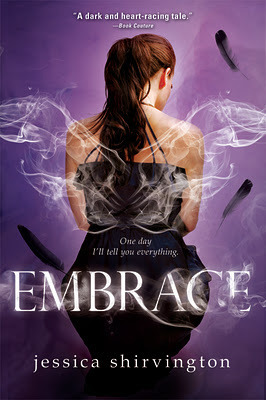 That being said, I really enjoyed Embrace and I'm now trying to get my hands on Entice and Emblaze because I want need to know what happens next. Jessica Shirvington has created a story that stands out from the rest with The Violet Eden Chapters and it's definitely one of the really good angel themed paranormal series out there. This sounds good..loved your review!